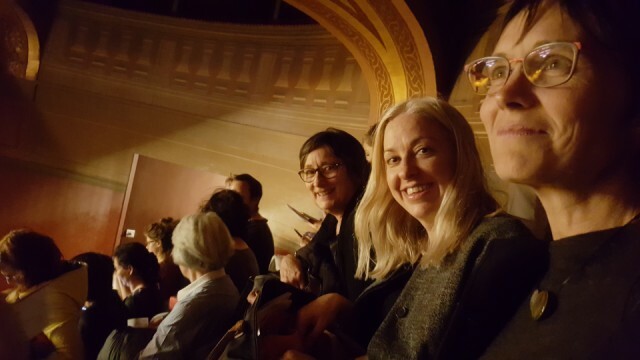 We saw a fabulous ballet last night at the Palais Garnier, choreographed by Anne Teresa De Keersmaeker for the company "Rosas". It was a modern ballet with nods to baroque dance -- the music was the Brandenbourg concertos performed on period instruments, the dancers ranged in age from their 20s to their 50s, and it even included a dog in one dance, who tried to herd the dancers and barked along to the music. Our seats were very high up, as you can see, but the sight lines were excellent! 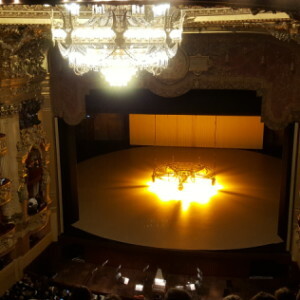 (see extra photo for the view from our seats -- you can spot the harpsichord in the orchestra pit).